How to clean your tarnished silver jewelry the fast, cheap, and easy way. You can make all your tarnished silver jewelry look like new in 10 minutes using materials you already have laying around the house. This technique works on all your sterling and fine silver jewelry. Also, it’s safe for delicate stones and pearls. Unlike the acid based cleaning solutions! And unlike acid based cleaners, you don’t have to buff and polish the finish back onto your pieces. It is such a mild process that it eliminates any handwork. Here is all you need. 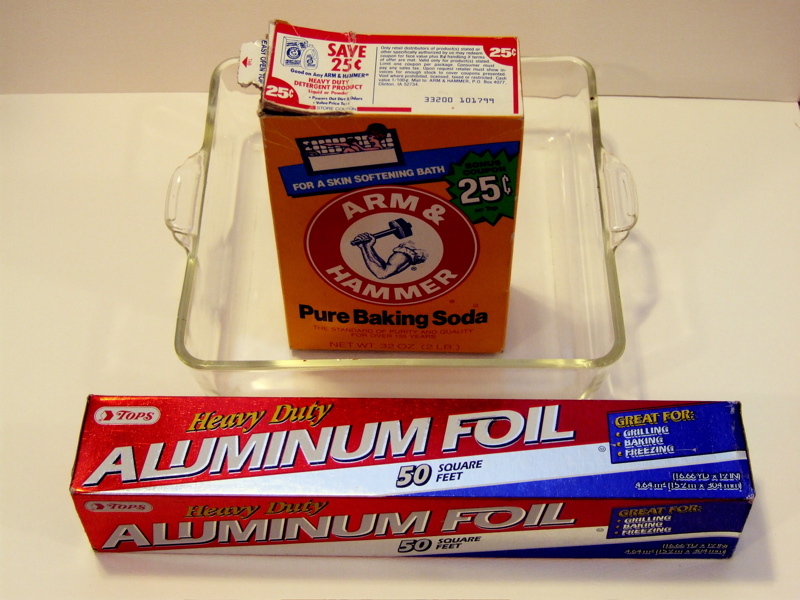 To get started line a glass dish with aluminum foil and place your jewelry on top. You can fit quite a bit in but don’t overlap pieces and make sure each piece is touching the foil. Note: Don’t put any kind of steel in with your jewelry to be cleaned. The reason is complicated, but if you don’t want any complications just don’t do it. 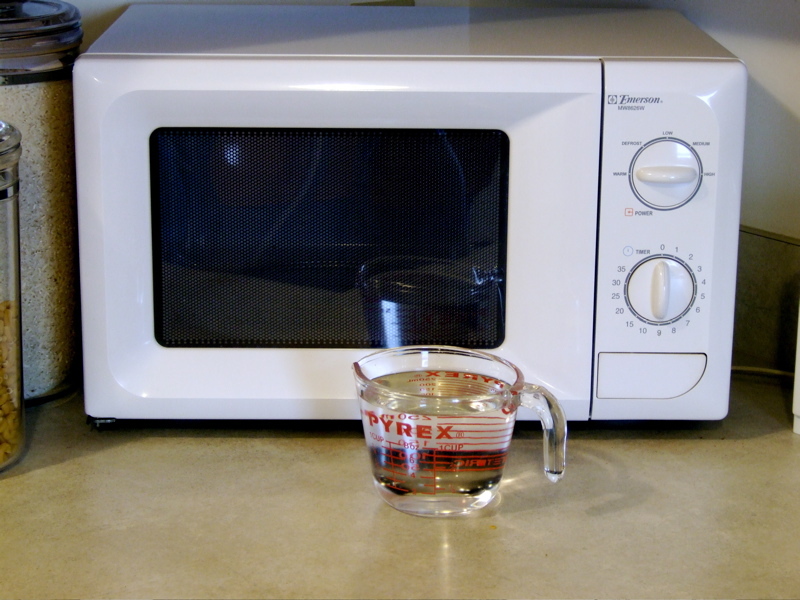 Boil enough water to cover everything, either in the microwave* or on the stovetop, then pour this over the jewelry and baking soda. Let soak for 10 minutes. Once the time is up, rinse under WARM water and put on a towel to dry. You don’t want to shock your jewelry with cold water because this has the potential to cause delicate stones and glass to crack or break! The tarnish is transferred from your jewelry to the foil effortlessly. 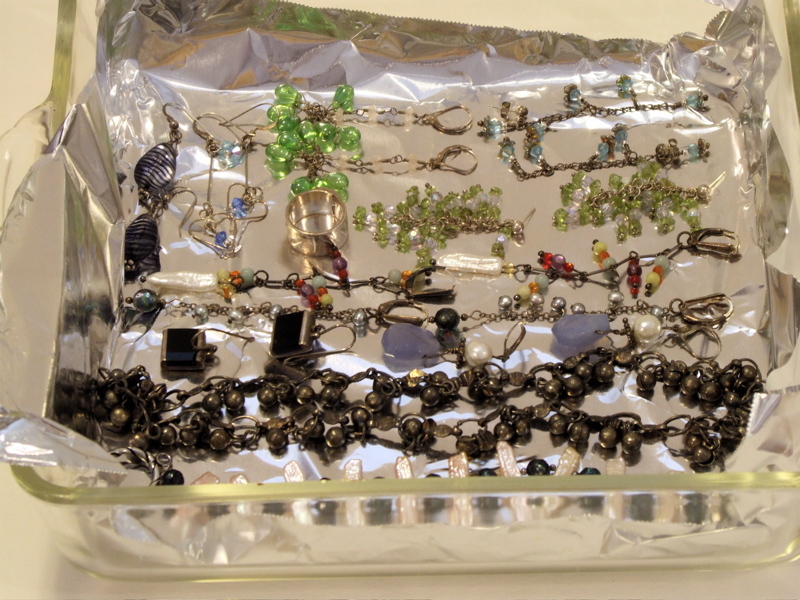 For pieces with excessive tarnish it may take 2 dips to make them completely shiny. This method is so easy and inexpensive that you will want to do everything you own and then look for more. 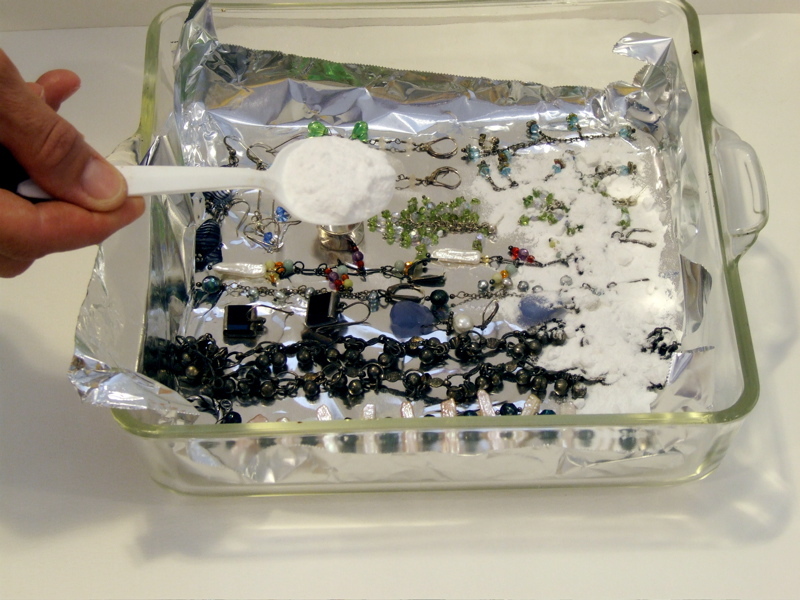 You will never think of using anything else to clean your silver jewelry again. 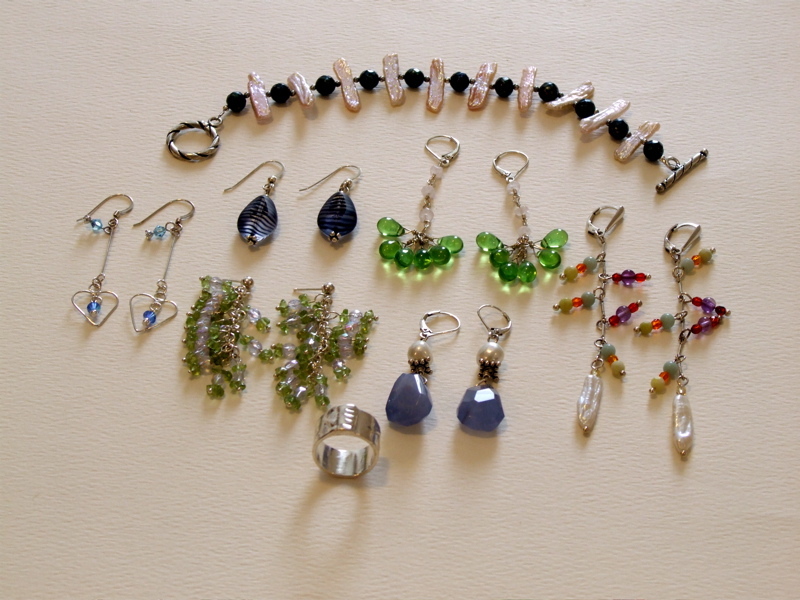 By the way… this is how I keep all my jewelry at www.sevenyaks.etsy.com clean. Do you Twitter? You can follow my latest tips, specials, and sales here. It's taken some engineering but I have a McMorran Balance! Interweave Knits Features My Mitten Blocker Design! is this good for silver plated costume jewelery? I have used it successfully on silver plated pieces. I would test something that might not break your heart if it didn’t go well before you commit to pieces with more emotional value. Oops! I used a jewelry cleaner that I thought was safe on my Pandora bracelet! I about passed out when it came out brass! I’m so glad I found your blog on this, it came out great! Thank you so much!!! Thanks for posting such great instructions – I had 2 necklaces I got from Kohl’s that were silver color and had tarnished black. This worked so well and they look like new! Silly question, will this be safe for a ring with little diamonds on it? Yep, totally safe. Just don’t shock any item with big changes in water temperature, that will cause something to crack. Thank you, thank you, thank you!! This was so helpful! Since moving to Seattle all of my silver jewelry was looking so terrible. I tried this and now it all looks new again! Thanks so much for posting this tip. I will be doing this on a monthly basis to keep my stuff nice! Thank you so much for this! It actually worked! Hello! Thank you for the great tutorial!!! I was wondering, can we do the same thing for gold jewelry? Or is there another method? I don’t know of a dip method for gold but you can use an old toothbrush and toothpaste to clean your jewelry. Toothpaste has a fine polish pumice in it and so it will buff but not scratch metal. Can you use a ceramic dish instead of the glass? 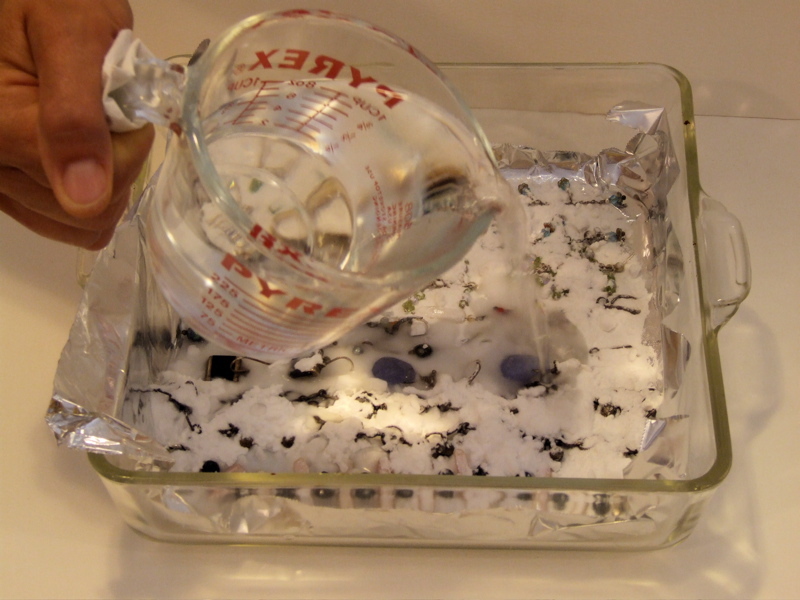 I used to use this method with borax washing soda this is certainly less expensive and more readily available. I would be careful with ceramics because some of the glaze compositions can contain metals. It is this same reason that makes some ceramics food safe and others as only decorative. I recommend glass because it is inert.